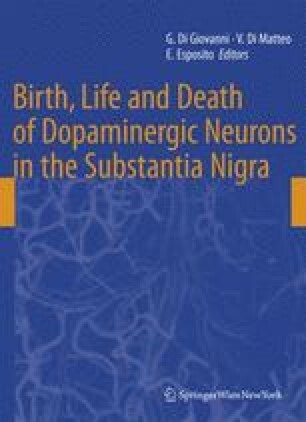 Although substantia nigra dopaminergic neurons are spontaneously active both in vivo and in vitro, this activity does not depend on afferent input as these neurons express an endogenous calcium-dependent oscillatory mechanism sufficient to drive action potential generation. However, afferents to these neurons, a large proportion of them GABAergic and arising from other nuclei in the basal ganglia, play a crucial role in modulating the activity of dopaminergic neurons. In the absence of afferent activity or when in brain slices, dopaminergic neurons fire in a very regular, pacemaker-like mode. Phasic activity in GABAergic, glutamatergic, and cholinergic inputs modulates the pacemaker activity into two other modes. The most common is a random firing pattern in which interspike intervals assume a Poisson-like distribution, and a less common pattern, often in response to a conditioned stimulus or a reward in which the neurons fire bursts of 2–8 spikes time-locked to the stimulus. Typically in vivo, all three firing patterns are observed, intermixed, in single nigrostriatal neurons varying over time. Although the precise mechanism(s) underlying the burst are currently the focus of intensive study, it is obvious that bursting must be triggered by afferent inputs. Most of the afferents to substantia nigra pars compacta dopaminergic neurons comprise monosynaptic inputs from GABAergic projection neurons in the ipsilateral neostriatum, the globus pallidus, and the substantia nigra pars reticulata. A smaller fraction of the basal ganglia inputs, something less than 30%, are glutamatergic and arise principally from the ipsilateral subthalamic nucleus and pedunculopontine nucleus. The pedunculopontine nucleus also sends a cholinergic input to nigral dopaminergic neurons. The GABAergic pars reticulata projection neurons also receive inputs from all of these sources, in some cases relaying them disynaptically to the dopaminergic neurons, thereby playing a particularly significant role in setting and/or modulating the firing pattern of the nigrostriatal neurons. Supported in part by NS034865 (JMT). We thank Fulva Shah for helpful comments on the manuscript.